This IBM® Redbooks® publication is one in a series of IBM books written specifically for the IBM System Blue Gene® supercomputer, Blue Gene/Q®, which is the third generation of massively parallel supercomputers from IBM in the Blue Gene series. This document provides an overview of the application development environment for the Blue Gene/Q system. It describes the requirements to develop applications on this high-performance supercomputer. This book explains the unique Blue Gene/Q programming environment. This book does not provide detailed descriptions of the technologies that are commonly used in the supercomputing industry, such as Message Passing Interface (MPI) and Open Multi-Processing (OpenMP). References to more detailed information about programming and technology are provided. This document assumes that readers have a strong background in high-performance computing (HPC) programming. The high-level programming languages that are used throughout this book are C/C++ and Fortran95. 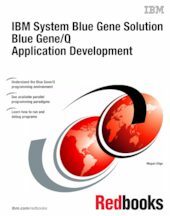 For more information about the Blue Gene/Q system, see "IBM Redbooks" on page 159.